Well, I still don’t have a computer, but that shouldn’t stop me from writing. Seriously. I’ve actually begun a new story over at Wattpad. If you’re into action and anime, you should check me out on Wattpad. I’ll definitely follow you back. My username is Hedekira16. But anyway, I thought I’d write a post about what kind of things you should expect from my series. It’s been a while since I blogged about my book, so I thought it’s about time that I gave all of you some more inside information about Elithius, the fantasy series I’m writing. A few things have encouraged me to post this actually. The first is having finished the fifth Harry Potter. Great series, everyone. I know I might sound dumb because I’m only reading this series now, but if you ever get the chance, read Harry Potter. The other thing that encouraged me to write about this was the “heart to heart” I had with my little sister last night…about our books. It was actually an awesome experience, it’s astonishing how much my sister has studied Elithius! And her own story has impressive depth and creativity, despite her age! So, having read Harry Potter 5, and talked about my series with my sister, I realized that there is A LOT to talk about concerning Elithius. First of all, I’m really starting to realize how close the THEMES are between my series and Harry Potter. One major theme in Harry Potter is the “mirror image” theme; Harry and Voldemort (the antagonist) are both extremely similar in their personalities, but they oppose each other for reasons of good and evil. What’s more, Harry and Voldemort have a mysterious…connection. They are able to be inside of each other without the other knowing, but, even though they are somehow magically connected, they cannot survive with BOTH of them alive. Crazy, but interesting, right? Well I was surprised to find that my series is quite similar. 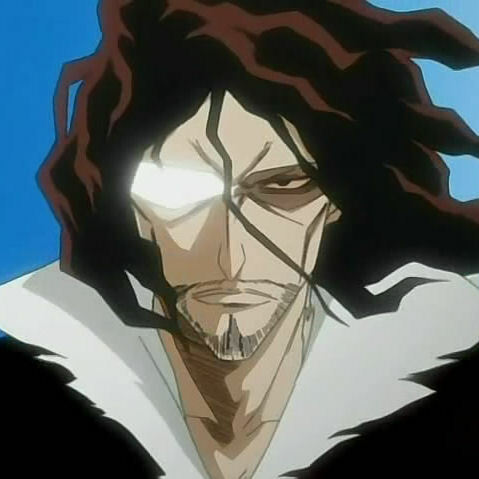 John Hedekira, the main protagonist of Elithius, encounters his dark mirror image in multiple antagonists…but one antagonist is literally the embodiment of John’s darker self. The interesting thing is, this embodiment of his darker self is always depicted as more glorious, powerful, beautiful, and seductive. I can’t say too much without spoiling anything, so I’ll stop. So basically, you can expect themes revolving around characters encountering their mirror images…and yes, oftentimes having a unique connection with them. Another popular theme in my series is the notion of relying on something stronger than yourself to fuel your power. Yes, this can include sorcery for the bad guys, and magical/supernatural assistance for the good guys. Make no mistake, my characters don’t just have evil spirits and good gods doing battle for them; but, depending on whose side you’re on, one of these will fuel your power. Other themes include revenge, redemption, forgiveness, the meaning of life, the meaning of battle, true unity among mankind, family, romance, and yes, many more. One of those themes listed above has always been very interesting to me: the meaning of battle. Have you ever thought about why we find action and (basically) violence so exciting and interesting? To a certain degree, isn’t this rather bothersome to acknowledge how violent we are as a society? Why do we desire battle? Why is it “cool” when we watch movies where people kill each other in epic, creative, or even dark ways? 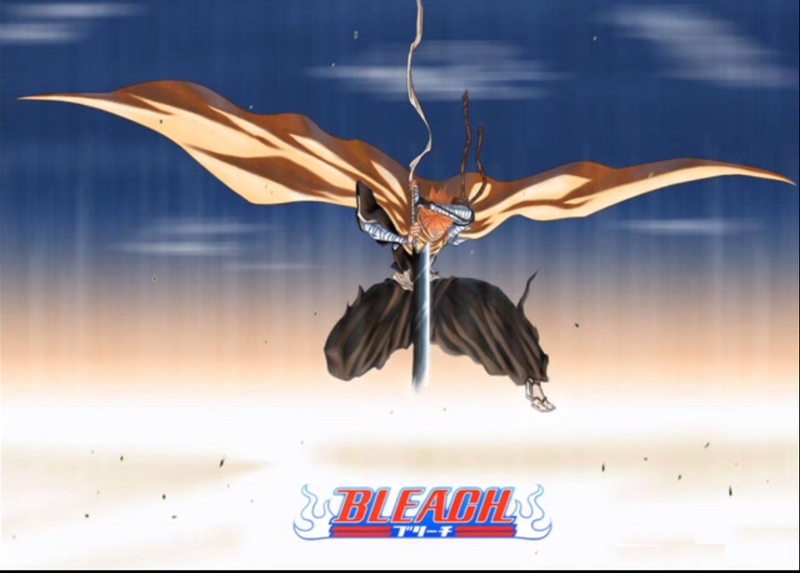 Although I don’t consider Bleach to be a very philosophical anime, the question of desiring battle and why you should fight DOES come up. 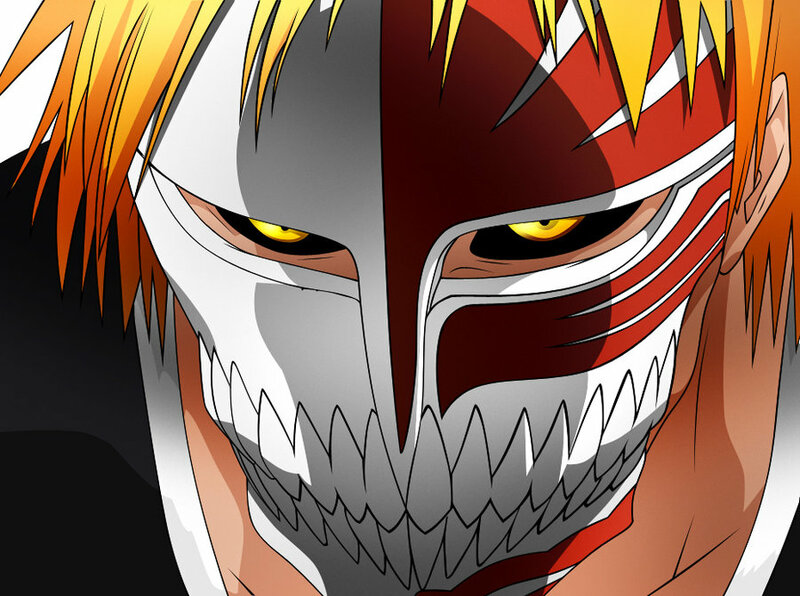 Particularly when Ichigo is trying to defeat his inner Hollow: he is told that he needs to have a “killer instinct”…which means he SHOULDN’T have a reason to fight. He should fight simply to be powerful. And that means defeating more and more enemies. 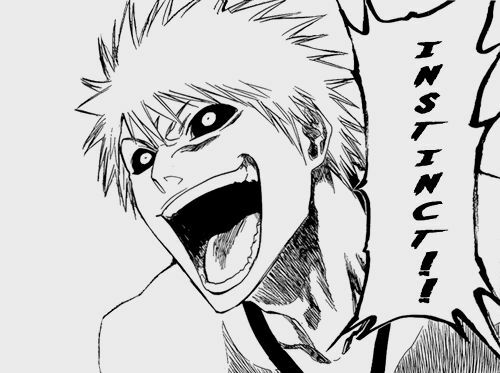 For a brief moment, we see Ichigo have this sense of “killer instinct”…because, well, he defeats his inner Hollow thusly. I never liked those reasons for fighting. I refused to believe that our love for fighting is so misplaced that it only revolves around a desire for power over others. It seemed wrong, and selfish. So, one major theme in my series is determining WHY you should fight, if it’s for good reasons, etc. The way you fight and what you’re fighting for determines the way your magical abilities will express themselves. Yup, a little complicated, but in a good way. I really hope all of you find my series interesting, or at least give it a chance. I know an author testifying about his own work is kinda lame, but that’s all I can give you right now (besides reviews from readers, of course). 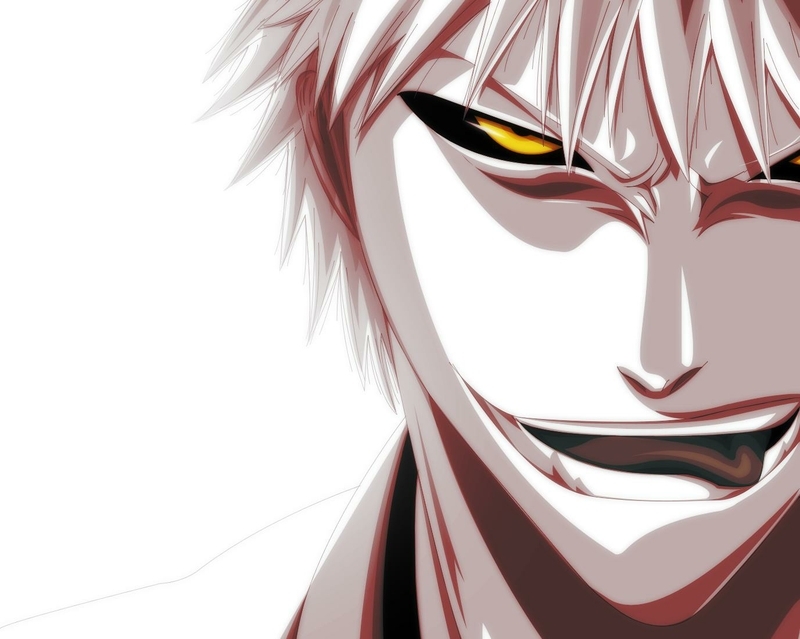 Showing you how awesome anime is…with gorgeously epic pictures!!! 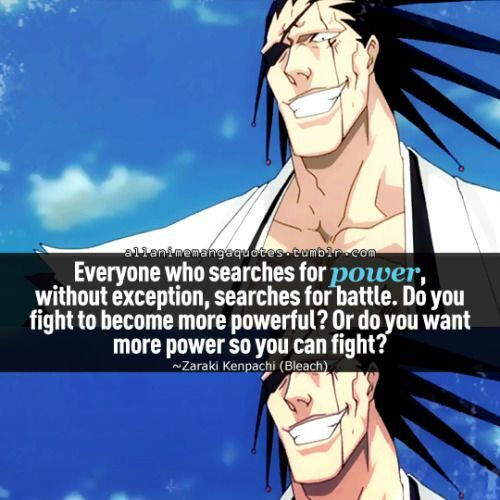 Only Captain Kuchiki can make raw power look beautiful. Note: this will contain LOTS of spoilers. And if you already know the story of FMA, feel free to skip to the section entitled “The Truth”. 1. Great character development. It’s hard not to feel for the characters in all of their struggles, hopes, triumphs, and defeats. 2. An exciting, elaborate plot, filled with complicated military strategies and rebellion, as well as a world of magic that could present a plot twist at any moment. 3. An incredibly realistic world, with scientific explanations for the “magic” upon which the series heavily focuses on. Not only are the scientific explanations, well, scientific, but even philosophical. On that last remark of reason #3, we find why so many people appreciate Fullmetal Alchemist. It’s so philosophical in a way that touches the hearts of its viewers, encouraging and even enjoining them to contemplate the actions or principles of the main characters. Hiromu Arakawa has created both a world and a group of characters that take on moral dilemmas and complex, ethically-blurry situations from a philosophical dimension. One of the most prominent philosophical themes/questions that Fullmetal Alchemist focuses on is that of Equivalent Exchange, or rather, as it is called most officially, “The Law of Equivalent Exchange”. The alchemist must understand the atomic or molecular structure of the matter in question. 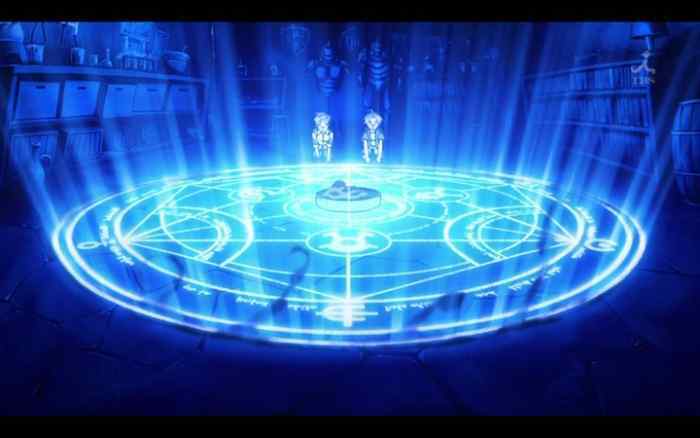 He or she must first use the alchemical power/transmutation circle to break down the matter. He or she forms something new from the broken down matter. In other words, the three basic actions are Comprehension, Deconstruction and Reconstruction. However, there are two “laws” that apply to alchemy, and ultimately to Equivalent Exchange. One of them is the Law of Mass Conservation, a law that exists in the real world, outside of the universe created by Arakawa. The Law of Mass Conservation, as it applies to alchemy, means that the amount of matter going into the transmutation will equal the amount of matter once the transmutation is finished. The second is the Law of Natural Providence, which means that if you are transmuting something made of steel, you can only produce something with the characteristics similar to steel; for instance, you couldn’t transmute steel and create water. In order to obtain something, something of equal value must be lost. For instance, a transmutation cannot be performed if no matter is placed within the transmutation circle; the circle must be “given” the matter it will transform. The Law of Equivalent Exchange relates directly to alchemy; it is seemingly a scientific principle of the alchemical arts. However, in Fullmetal Alchemist, Edward and Alphonse (Ed and Al) take Equivalent Exchange further and (in a most philosophical manner) seek to apply it as a moral code: a principle to be followed in the face of every complexity and endeavor a person could work through and towards. Thus, Equivalent Exchange is applied to actions. Many would agree that, perhaps, this “law” certainly makes sense. Equivalent Exchange technically states that if you want something, you need to put in the necessary amount of effort to get what you want. Ed and Al fail to apply the Law of Equivalent Exchange when they try to resurrect their mother. At this point in their lives, Ed and Al are only children, and–having been abandoned by their father–their mother meant everything to them. After their mother dies, the brothers begin studying alchemy in earnest in order to learn how to perform a Human Transmutation. However, Human Transmutation is strictly forbidden by every alchemical authority; it is impossible to accomplish, and extremely dangerous. You cannot resurrect someone from the dead. Ed and Al are reckless, however. They will try to bring back their mother no matter what. They gather every elemental component of the human body, and then each of them contribute a drop of blood. Thus, the brothers believe that they themselves will lose nothing as a result of Equivalent Exchange; they have provided the means to make a body (via the elemental components), and their drops of blood are for creating their mother’s soul. Try as they might, two drops of blood don’t equal the value of a human soul. The transmutation fails, and Edward’s leg is taken from him as Equivalent Exchange tries to make up for creating a human soul. Alphonse loses his entire person. Shocked by their failure, Edward quickly sacrifices his arm and manages to bring back Alphonse’s soul and bind it to a suit of armor. 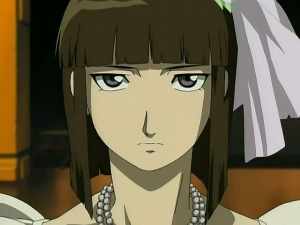 It would seem like, after the transmutation, Edward and Alphonse have given so much to resurrect their mother. Surely they have given enough to bring her back. Unfortunately, they are rewarded with a creature that isn’t even human. The plot of Fullmetal Alchemist then becomes Ed and Al searching for ways to fix their bodies. Ed has vowed to return Al’s soul to his body, and Ed would also like to get his arm and leg back. Both of them understand that fixing their bodies will require another Human Transmutation. But, egged-on by stories of the legendary Philosopher’s Stone, a super alchemical-amplifier, they believe that returning to their bodies is still possible. Ed and Al still believe that if they sacrifice enough, if they try hard enough and put enough effort into their quest, they will be rewarded in the end. 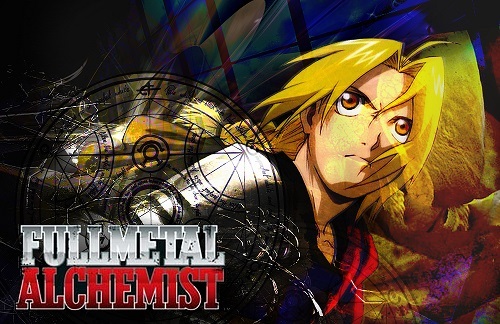 Although the general plot is the same as Arakawa’s manga adaption of Fullmetal Alchemist, the anime Fullmetal Alchemist, which aired between 2003 and 2004, mostly contains episodes that are different from Arakawa’s original story-line. 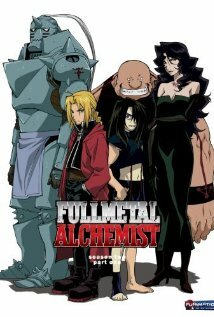 This version of Fullmetal Alchemist, in spite of how it lacks authenticity in its relation to Arakawa’s version of the story, heavily focuses on the internal and emotional struggles of Edward and Alphonse, as well as the credibility of the Law of Equivalent Exchange. The anime Fullmetal Alchemist displays Ed and Al’s quest not only as an adventure, but a search to discover the truth–the truth about alchemy and the Law of Equivalent Exchange. Ed and Al have religiously believed in the laws of alchemy, and especially in Equivalent Exchange. As stated previously, the brothers believe that if they give enough effort to their quest, they will succeed in the end. According to the Elrics, that’s how life works; if you persevere and work hard, it will pay off. It’s Equivalent Exchange. It’s hard to ignore the fact that there is a certain beauty to the Law of Equivalent Exchange, if it is indeed real. In the anime Fullmetal Alchemist, it’s difficult not to identify with the reasoning of Ed and Al (but specifically Ed). The Law of Equivalent Exchange makes every action that we take towards a certain goal worth something. There is also a beautiful sense of simplicity in regards to the logic of Equivalent Exchange. Edward seems especially connected to this part of Equivalent Exchange; the peace and confidence of mind that comes with knowing that he’ll be rewarded for all of his struggles. The audience of Fullmetal Alchemist finds themselves hoping that Ed and Al are right; hopefully, Equivalent Exchange is real. The truth about Equivalent Exchange finally comes to light when Ed confronts Dante, the main antagonist of Fullmetal Alchemist. Dante is a powerful alchemist that has survived for centuries, using the power of the Philosopher’s Stone to transport her soul into a new body each time she starts growing old. However, as Ed points out, every time she “jumps” bodies, she loses a part of herself through Equivalent Exchange. As a result, her soul can’t remain in the bodies she uses for very long. But then Dante replies: Equivalence? Don’t tell me you still believe in that naive theory. Ed: It’s no theory! It’s the absolute law of alchemy! No, of the whole world! To obtain anything, something of equal value must be lost. You couldn’t have gotten anywhere without knowing that. Dante: A beautiful story, told to the oppressed and to make children do their lessons. The truth is, the Law of Equivalent Exchange is a lie. Dante: “To gain, something of equal value must be lost”; conversely, if you give something up you will always gain a prize of equal worth in return. Ed: Exactly. That’s why people work hard at anything they do, because it pays off. Dante: Wrong. People work because they believe it will pay, but “equal effort” doesn’t always mean “equal gain”. Dante: Consider the State Alchemy exam, which you passed with flying colors. How many others took the test that day, spent months, years preparing, some working much harder than you, but you were the only one who passed? Where was their reward? Was it their fault that they lacked your natural talent? (Later in conversation) Dante: People can say there’s a balance, a logic that everything happens for a reason, but the truth is far less designed. No matter how hard you work, when you die, you die. Some spend their lives trying to scratch their way to the top, but still live in poverty, while others are born into wealth without ever working at all. It’s a cruel and random world, and yet the chaos is all so beautiful. And their debate ends there. Ed doesn’t seem entirely convinced with Dante’s reasoning. But he’s obviously discouraged, able to think of no reply to Dante. He can see the truth in her words. No argument is needed to reaffirm Dante’s words. Equivalent Exchange, it seems, has been proven wrong. An episode later, Edward is once again told that Equivalent Exchange isn’t real, this time by his own father, Hoenheim. Hoenheim leaves without giving Edward an opportunity to argue, but as Ed watches his father leaves, we hear his thoughts, cast out to Hoenheim and the audience. Ed: I can’t agree with you. I know that if I try my hardest, I’ll be rewarded, and I believe that applies to all of us. It doesn’t matter who you are. If you work hard, it pays off. I know Equivalent Exchange is true. Ed: If it’s childish to believe in this, so be it. I’d rather be a child than follow a doctorate of cynicism and chaos…apathy. I thought that I didn’t care, Dad–that I didn’t need to believe in things. But I was wrong. It is interesting to note that now we have a popular contradiction, insofar as recognizing Truth goes. Hoenheim and Dante both believe that Equivalent Exchange isn’t real. Their argument is based on reason. Edward’s argument is a bit more personal, but still authentic all the same. Ed’s argument is based on faith. Edward is sent by Dante over into our world through “The Gate of Truth”. He has an alternate-self living in London during World War I. He, as his alternate-self, dies when a German zeppelin crashes. 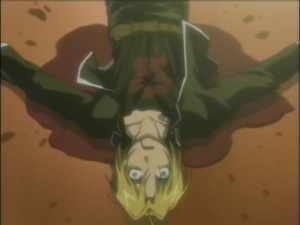 As a result, Ed comes back into the world of Fullmetal Alchemist as himself. However, he is soon after killed by the Homonculus Envy. Ordinarily, he would go back into our world to his alternate-self…but his alternate-self has already died. Thus, Ed will seemingly really die. But then Alphonse, who’s been turned into a Philosopher Stone himself, sacrifices himself in an effort to bring Edward back. He is successful; in this case, Equivalent Exchange prevails, since a life is traded for a life. Once Edward returns, he immediately proceeds to drag Alphonse back, body and soul, as an eleven year-old boy. 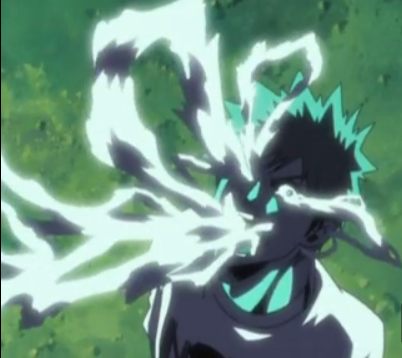 And from this action the ultimate fulfillment of Equivalent Exchange occurs. Edward should’ve died. Having sacrificed himself for Alphonse, and having no alternate-self to go to once beyond the Gate of Truth, it is seemingly impossible for Ed to survive. But then he finds himself back in London, as himself, with his father once again. And Edward is, rightfully so, confused. Why did he survive? He traded a life for a life. Why is he still alive? It is Ed’s father, who, having rebuffed the notion of Equivalent Exchange earlier, provides an answer for Edward. You boys had a long journey. All the people you helped along the way, all the hardships, the pain of losing friends you loved, the determination, sweat, blood…don’t you think that might’ve been the price you paid? And so it seems that, in the end, Equivalent Exchange really came through for Edward after all. Is Equivalent Exchange real? Reasonably speaking, no. Unfortunately, the world just doesn’t work that way. However, it is definitely good when we are able to work for something, and be rewarded in the end. Perhaps it is straight-up idealism, and perhaps belief in Equivalent Exchange is childish, but it is a “law” to be respected, and in some cases, encouraged. To believe in Equivalent Exchange requires faith…even if you’re an agnostic, science-loving, 4’11 alchemist! I guess I don’t really have an answer. What do you think? 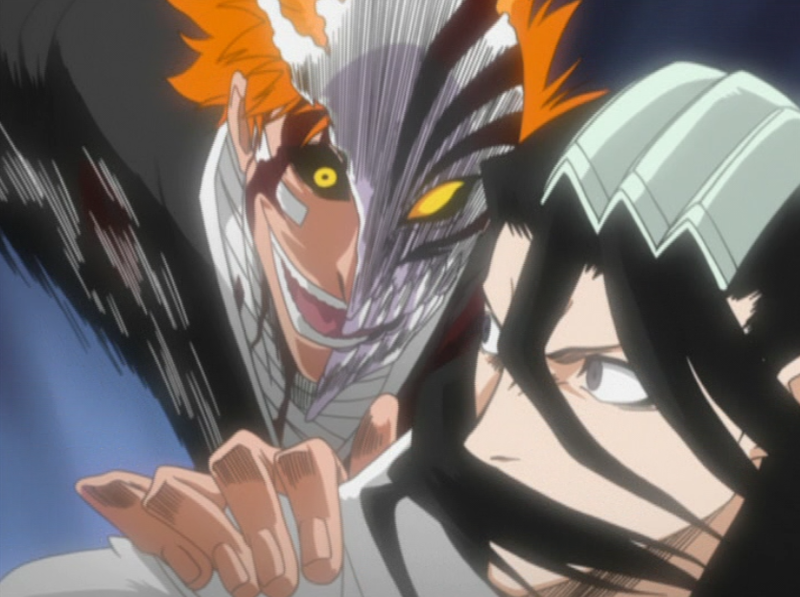 Ichigo knows he isn’t powerful enough to defend everyone he cares about. What’s more, whenever he fights and uses more of his own spiritual power, the chances of him being possessed by his inner Hollow skyrocket. 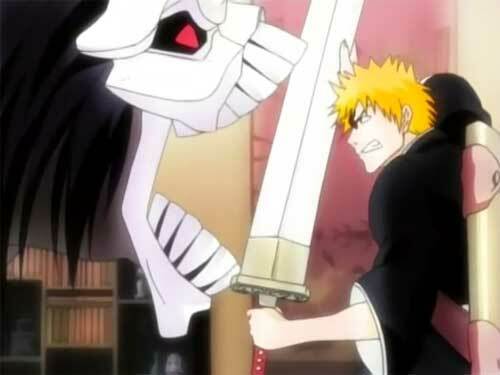 His resolve being torn down by the emerging of his inner Hollow, and the threat of exceedingly strong enemies, leaves Ichigo confused and unsure of how he can protect his friends. P.S. Through the end of July only, my eBooks are free at Smashwords.com! The sirens won’t stop blaring throughout the building. I grip my head, feeling blood run down my face and through my fingers. I’m losing control. Losing sanity. What’s going on? Why am I here? Who am I? The air is both cold and refreshing. But it is also harsh; I don’t feel comfortable in it. I’m naked. A shiver runs through my cold body, even as my head burns with pain from the hole in my forehead. The ground shakes beneath me as some explosion erupts somewhere in the building, jostling my cell. My legs are still adjusting to the hard, lifeless stone beneath me. The lights won’t stop flashing, the sirens won’t stop ringing. I’m so confused. What’s happening? The last thing–or maybe it’s the first thing–I remember is pain running through my body. I was lying on an icy, metal table, and I noticed someone next to me. He was holding a long syringe, empty of whatever fluid it had previously held. I couldn’t see him; he was drenched in shadow. But he spoke to me, his voice rich and yet eerie, saying, “You are the final experiment, the most prized of my creations. Come, and I will teach you how to serve me.” And he put me in this cell. That was only five minutes ago. I was born five minutes ago. I remember nothing before that; I don’t know if I ever existed before waking up on that metal table. And then after that, all that comes to mind is my own appearance. I raise my eyes, peering into the glass wall surrounding me, and I see my reflection. The ground shakes beneath me again, and this time I am thrown from my feet. I land on the stiff stone, bruising my knees, and then another explosion occurs. The glass walls of my cell burst and shatter, thousands of shards clashing against the floor and rebounding off each other as they plummet. I raise my head, and through the demolished wall of my room emerges a dark figure. His long black hair flows behind him, held back from his face by white headpieces. 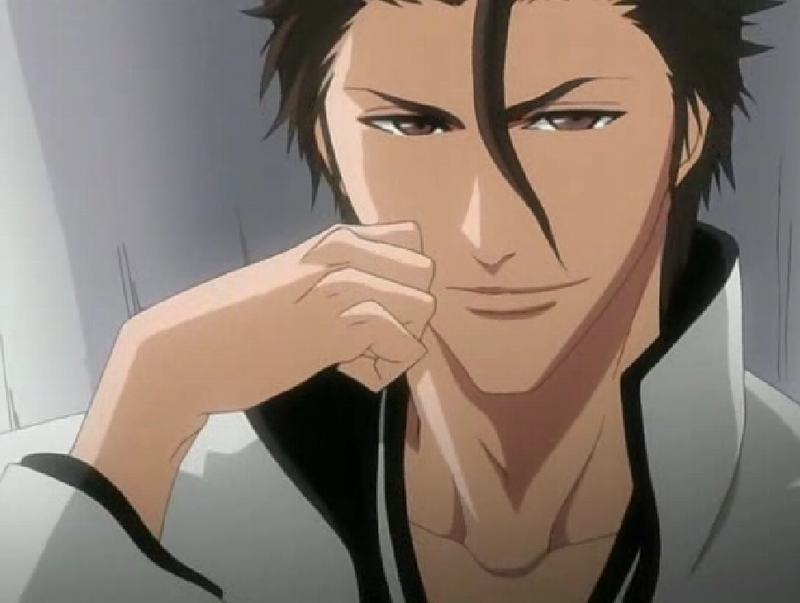 He wears a long black robe, topped with a shorter white one. Thousands of small, black objects hover in the hair around him. An image flashes in my mind again. It is of the same person. Only he is not so dark. He is surrounded by light and pink petals, which are sharp as daggers. This person is surrounded by a black cloud of tiny knives. “Who are you?” I shout. His army of petals sail towards me. And a pang of understanding rises within me. I cry out. I don’t know how it happens. My battle drive is activated. I don’t know how I know, but I do. The knowledge has been with me since I was born. Now I know how to make sense of this knowledge. The knives fly towards me. “Getsuga…Tensho!” I spread my arms out, like a dragon about to take flight, and a huge blast of power, whipping and dancing, black and wrathful, discharges from me towards the other Byakuya. He gasps. The explosion destroys half the building. For a few moments, there’s only dust, and confusion. Everything happened so quickly. And for the first time in what feels like forever, there is silence. I don’t know if anyone died. I don’t know if anyone survived. But I was able to escape. I alight on the roof of the building, the building where I was born, deep within this dark world. I look upon what my power has wrought. I don’t understand. I don’t understand who I am. I don’t understand this power. Who am I? Why was I created? I clench my fists, my own confusion making me frustrated and full of rage. “Dammit!” I think. I raise my head to the sky. “Who am I?” I say aloud. Then I suddenly know where to go. Another image flashes in my mind. This time, it’s of a town. 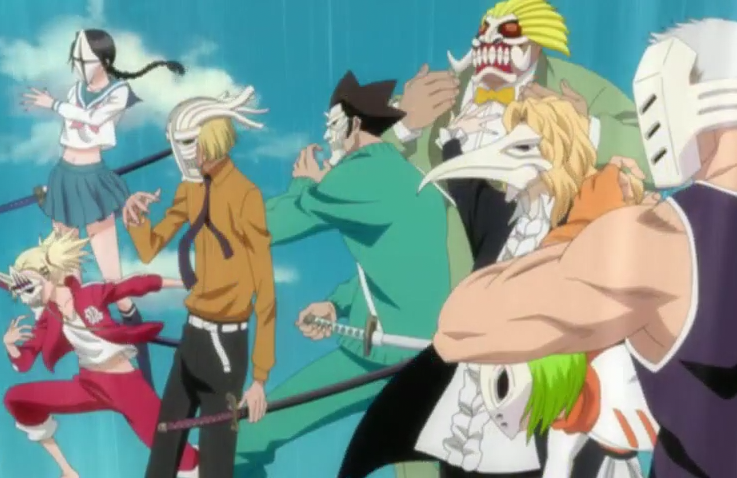 And I don’t know how, but I know it’s name: Karakura Town. Just a reminder that my book The Golden Lands, Volume 1 is now a free download for a limited time at Smashwords.com (https://www.smashwords.com/books/view/535151). Please consider taking advantage of this opportunity! You WON’T be disappointed!